Here’s your chance to savour something different before the Chinese New Year festivities kick in next week. From modern Asian fare that will take you through three countries in one meal, to inspired Latin American dining at two restaurants, reasons to squeeze in an early feast are aplenty. We were introduced to this mod-Asian restaurant’s Not So Lonely Planet series last year through its ingenious, Asian-inspired cocktails. Now, head chef Miller Mai has created an inspired menu that takes diners through Myanmar, Thailand and Malaysia in one meal. The menu features a selection of two dishes from each country from which you can choose from to customise a three-course lunch menu. For a light start, there's a choice between a housemade chickpea tofu enhanced with beef jerky, chilli and garlic (Myanmar) or boneless chicken wings stuffed with sweet corn, peanut and palm sugar glaze (Thailand). 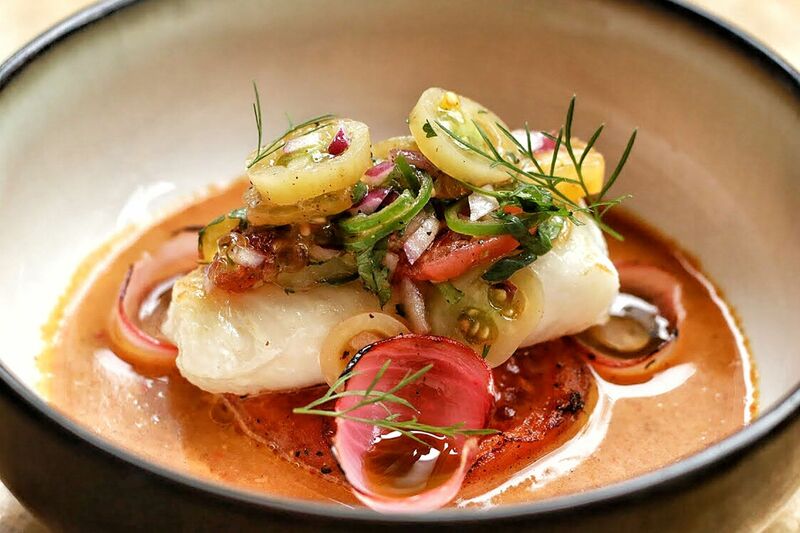 Heartier options include a Burmese tomato fish curry that’s not so heavy on the palate with the addition of pickled shallot and grilled tomato. There's also his take on the Sarawak laksa that's loaded with tiger prawns and rice vermicelli. Looking for a worthy burger alternative? You wouldn’t want to miss The Number Five burger, a signature at the brand's Los Angeles outlet which is now available in Singapore until February 28. What makes it extra special is it’s a big bite of buttery brioche buns holding together a juicy all-American beef patties, smoky beef pastrami, melted baby swiss cheese, crisp onion rings and house-made thousand island dressing. You may know of Mexican chef Sergio Meza from Villanos en Bermudas, which currently holds the 15th spot on the Latin America’s 50 Best Restaurants list. If you’ve always wanted a taste of his cooking, you can do so at two not-to-be-missed events this week. The first night takes place on January 30 at the open kitchen bar of Ola Cocina del Mar. He’ll be serving up a lip-smacking taco tasting menu—think crisp quesadilla filled with black beans and mushrooms with a side of sikil pak (pumpkin seed dip); fish taco done ensenada syle; as well as chicken taco drizzled with tangy, herbal huacatay sauce. Meza will then bring the party to Tono Cevicheria on January 31. It will also be a celebration of all things Peruvian—from the lively music to the delicious food. If the mini empanaditas bursting with seafood doesn’t fill you up too quickly, there's much more to savour, including green plantain crackers topped with beans and black garlic hummus, and Mexican flour tortillas that you have to dip in a mix of scarmoza cheese and avocado. Le Petit Chef is in Singapore from now until February 4 for a signature pop-up dinner event at La Brasserie. For those who don’t know him, he’s an animated character dreamed up Belgian artist collective Skullmapping, aimed at redefininig your dining pleasure through cutting-edge technology and delicious fare. Using table mapping, he’ll engage all your senses through special effects and witty storytelling surrounding his pursuit of a good meal. These all eventually lead to you tucking into a four-course menu cooked up by the restaurant's chefs; dishes include poached Maine lobster with baby asparagus, truffle aioli and avruga caviar, and a 200-day grain-fed angus tenderloin with sauce Périgourdine. After a leisurely but filling lunch at this Italian restaurant, stay for the Terraza Martini happy hour available from Sunday to Friday, 5pm to 7pm. During these golden hours, resident mixologist Claudio Russo will be concocting imaginative cocktails such as Grey Goose Martini, Pesca Spritz, Martini Spritz, Spritz Bianco and Martini & Tonic—at very reasonable prices. What’s a cocktail without nibbles, right? When you order any of these drinks, you’ll also get complimentary anti pasti—a plate full of freshly sliced cuts, marinated olives, sundried tomatoes, and our favourite parmesan cheese.